Dr. Adel Kardosh graduated from the Keck School of Medicine of USC and completed his residency program at the University of Southern California. Then, he did a fellowship at the Stanford University. He is specialized in Medical Oncology and board certified in Internal Medicine and Oncology. 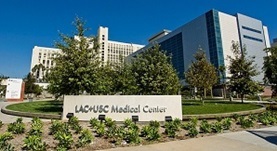 Dr. Kardosh has been in practice for more than 3 years and is affiliated with the LAC-USC Medical Center. During his career, he has also contributed to several research publications. Dr. Adel Kardosh has contributed to 3 publications. Genes involved in pericyte-driven tumor maturation predict treatment benefit of first-line FOLFIRI plus bevacizumab in patients with metastatic colorectal cancer. Volz, N. B.,Stintzing, S.,Zhang, W.,Yang, D.,Ning, Y.,Wakatsuki, T.,El-Khoueiry, R. E.,Li, J. E.,Kardosh, A.,Loupakis, F.,Cremolini, C.,Falcone, A.,Scherer, S. J.,Lenz...; Pharmacogenomics J.. 2014 Jul 30. Antiangiogenic activities of 2,5-dimethyl-celecoxib on the tumor vasculature. Virrey, J. J., Liu, Z., Cho, H. Y., Kardosh, A., Golden, E. B., Louie, S. G., Gaffney, K. J., Petasis, N. A., Schönthal, A. H., Chen, T. C., Hofman, F. M.; Mol Cancer Ther. 2010 Mar. Golden, E. B., Lam, P. Y., Kardosh, A., Gaffney, K. J., Cadenas, E., Louie, S. G., Petasis, N. A., Chen, T. C., Schönthal, A. H.; Blood. 2009 Feb 05.